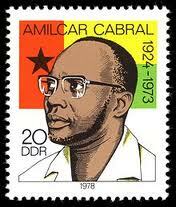 January 20th, is the day of Amilcar Cabral, the father of Cape Verde and Guinea Bissau independence was murdered. I would like to celebrate this day of remembrance with a poem written by Amilcar Cabral himself. He used to sign his poem by the name Larbac, which is an anagram of his last name Cabral. The current poem is attributed to him… I was unable to find the Portuguese version. Enjoy this poem by one of Africa’s greatest sons. Do not run away from life itself. And you, Poetry, you are also a Man. Let your poems flow to every race, to all things. I am my own Poetry. You just made me so, so very proud of my Africanness. Thank you for sharing this deeply Soulful poem. I shamefully confess that I wasn’t even aware that our beloved Father, Amilcar Cabral, wrote poetry. What a joy, this pride! I AM AN AFRICAN!!!!!!!!!!! Indeed Boniswa, great minds are indeed great… Amilcar Cabral was a poet as well as a great leader. Thanks for commenting.